Our bible classes at church are going through a study of the Elijah and Elisha narratives in 1 and 2 Kings. For our bible class this week I taught the stories from 1 Kings 17, and during class I made a connection with Advent. Elijah is introduced to us in the opening verses of 1 Kings 17. After the previous chapters chronicling the kings the prophet rudely enters and interrupts the story. King Ahab and Queen Jezebel have turned away from YHWH to worship Baal, the Canaanite rain god. In a direct assault upon the rain god Elijah pronounces a drought to the king. At the start of the drought Elijah is fed by ravens by a brook in the Kerith Ravine. As the drought worsens and the brook dries up Elijah is sent into enemy territory, to Zarephath in Sidon, the providence at the heart of Baal worship. In Zarephath Elijah encounters a poor widow who, along with her son, is on the brink of death. The widow, in a display of faith, gives the last of her food to the prophet. In reward for her trust and hospitality YHWH provides for them all. 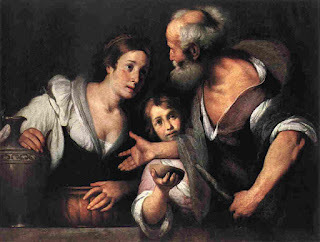 And later, after Elijah raises her son from the dead, the woman comes to confess that Elijah is the true prophet of God. It's a humble and intimate story. God working through small things--birds and the small gifts of a poor widow. The characters are mundane and the location is marginal. Small people doing small things in unlikely places. And through them God invades enemy-occupied territory to bring dead things back to life. God and his agents enter into enemy territory and begin to conquer the powers of death from within. No military, political, or ecclesiastical powers are active here. Indeed, the sources of life in this chapter are not normally associated with power. Here we have no imposition of strength from without, no exercise of power as it is normally conceived. Rather, effective power is exercised through the birds of the air, small gestures, meager resources, feeble words, human obedience, and the witness of a poor woman. Through such lowly means, God's work gets done, even in the most hostile of places. And isn't that, I said to the class, exactly what we see with Christmas? On the edges of geopolitical power, in the most hostile of places, a poor, young peasant girl says "Yes" to God. And a baby is born. God and his agents enter into enemy territory and begin to conquer the powers of death from within.